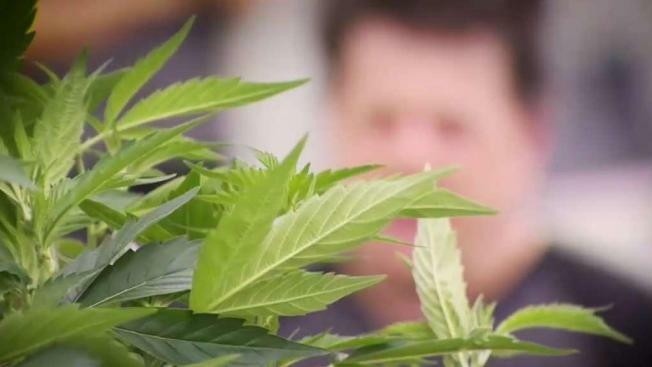 Four months into the legalization of cannabis in California, the NBC Bay Area Investigative Unit found only a fraction of pot growers have attempted to go legit. Investigative Reporter Liz Wagner goes to the heart of cannabis country – Humboldt County – to find out why. This story aired on April 26, 2018. Humboldt County pot farmer JD grew weed for decades before the once-illicit plant became legal in California, but ironically, legalization could spell the end of JD’s farming days. He’s still growing illegally, without having obtained the necessary local and state licenses, but just until he saves enough money to make his escape and start a new life somewhere else, he says. Count him among the majority of Emerald Triangle growers who watched legalization come to California but decided not to step out of the shadows. It’s also the reason he asked NBC Bay Area to call him by a nickname. JD wanted to go legit, he says, but scrapped those plans when he realized the hefty price of complying with state and county regulations. “I looked forward to doing it, but it ended up being a lot more expensive than you would think,” JD said. On top of new fees and taxes levied by state and local agencies on growers opting to join the regulated market, it can cost hundreds of thousands of dollars for growers like JD to bring their land up to code. With weed currently being sold at rock-bottom prices, running a small pot farm simply doesn’t pencil out anymore for a lot of growers in JD’s shoes. JD is among the vast majority of California cannabis farmers who are still operating illegally or giving up their farms altogether. The California Growers Association estimates there are about 68,000 cannabis cultivators in the state. But data from the California Department of Food and Agriculture (CDFA), the agency responsible for licensing cultivators, shows only 8 percent of those estimated growers have even applied for temporary state licenses. Just 5 percent of growers have actually been granted one. Some growers blame this on regulators, saying they haven’t done enough to ensure small farmers can survive in the new era of legal weed, leaving them no choice but to fold or take their chances on the black market. Others call it the price of regulation, an unfortunate but necessary consequence of bringing legitimacy to an industry that’s spent decades operating with the threat of criminal prosecution looming overhead. With regulation come taxes, fees and red tape – no different than what any small business owner in America has to deal with, they say. County to county, it’s tough to pin down the percentage of growers who have opted to go the legal route. In Sonoma County, data show only about 4 percent of growers have initiated the process. Just to the North, in Mendocino County, roughly 18 percent of growers have submitted applications to the county. That’s using the low-end estimate of 5,000 growers in the county, but officials say the true number is probably closer to 10,000. In Humboldt County, which has done comparatively well in bringing its growers into the fold, roughly 30 percent have at least begun the permitting process. That’s according to Humboldt County officials, who estimate the total number of growers in the county to be roughly 6,000. But some believe there are significantly more grow sites in the county, perhaps upwards of 15,000, which would mean considerably more pot farmers are operating illegally. “There are some people who are rightly panicking right now because they recognize that the world they know is going to be different, and it may not work for them, and it’s unsettling,” said John Ford, planning director for Humboldt County. Policing the black market is now largely out of the hands of law enforcement in Humboldt County and handled by Ford and his team, who use aerial images to spot illicit grows. Getting caught means significant penalties of $10,000 per day for each violation. Ford says the system has had more success at shutting down illegal grows than the law enforcement raids of old. Ford’s team has already sent out about 100 letters to properties with illicit grows and expects to send out more than 500 by the end of the summer. He knows many growers in the county will struggle to survive on the regulated market, and he says the county is making every effort to engage small farmers in the process. But he believes removing the black market from the equation is what’s best for the county. “We do want the cannabis industry to be successful, and the way it’s successful is that it has a level playing field and that everyone is complying with the same requirements,” Ford said. Humboldt County grower Scott Davies gives Ford a lot of credit for his work trying to bring cannabis cultivators into the regulated market. Davies came to Humboldt County in the 1980s. He fell in love and hasn’t left since. Now, he runs Winterbourne Farms, tucked up against the Mattole River in a remote part of the county. He’s a fierce advocate of regulating the industry and moving beyond prohibition and was among the first growers in county to begin the permitting process. Davies says he spent years looking for the perfect property for growing cannabis on the regulated market, believing legalization was all but inevitable. Davies, who also co-owns the Humboldt Legends distribution company, understands the majority of growers in the county, many of whom have been growing for decades, are simply not going to make it. He feels for them but says a bit more foresight could have likely saved some growers from the precarious positions they now find themselves in. “I think some of the people didn’t prepare as well as they should have, and now they are suffering,” he said. But Davies said it also comes down to size. Davies said Winterbourne Farms is about the smallest size operation that can make it on the regulated market without a lot of additional stress. “I think 20,000 square feet is just over the kind of cutoff that makes the most economic sense for people to go into the permit path,” he said. By comparison, JD’s grow is just a fraction of the size of Winterbourne Farms. Davies acknowledges the steep price of coming into compliance for growers, but chooses to view the cost as a long-term investment in his business. He says the process has cost him upwards of half a million dollars so far. He understands he’ll now be competing with some of his neighbors who choose to remain on the black market but isn’t overly concerned as long as their illicit weed is only being sold out of state. “My expectation is that the black market won’t go away but that I won’t have to compete with the black market in the retail, regulated channel,” he said. Keeping black market pot out of the regulated market is now up to state regulators like Lori Ajax, Chief of the Bureau of Cannabis Control. She says they are trying to balance the needs of farmers while still maintaining the regulations she says are in the best interests of the industry, consumers, and the environment. “I think it’s our job, along with local jurisdictions, to not create a situation where the black market is thriving,” Ajax said. It’s still early in the process, and Ajax says she expects more growers to come onboard in the coming months. She says the bureau, along with the state’s public health department – and CDFA, which regulates cultivators – are fine-tuning the rules right now. Growers committed to going legit tell NBC Bay Area they look forward to ending cannabis prohibition and ushering in a new era of legitimacy and stability to the industry, despite any potential challenges and growing pains. Regulation, they say, helps protect the environment from degradation, lets consumers know where their pot was grown and that it’s free from mold and pesticides, and ends the criminalization of those in the industry. But no matter how hard regulators work to bring cultivators into the legal market, state data show the California market simply can’t support everybody. According to a recent report by the California Department of Finance, Californians consumes only about 20 percent of the 13.5 million pounds of pot the state’s growers produce each year. The report estimates about 11 million pounds is shipped out of state, which is still currently illegal under state and federal law. So, by all accounts, the state’s illicit cannabis market is here to stay. But the reasons growers remain in the shadows can be quite different. For some farmers, like JD, the decision to grow on the black market comes down to economics. It can be too costly to come into compliance without access to a boatload of capital. Larger growers, often backed by investors with deep pockets, can afford to hire consultants and lawyers to help them navigate the licensing process. They can also withstand the new fees and taxes that growers have to hand over to a handful of different government agencies. Another faction of growers never intended to join the legal market at all, some Emerald Triangle cultivators say. Some don’t trust the government and have significant doubts about handing over their personal information to local and state authorities. Many others will be tempted by the significantly higher prices California weed sells for out of state. “Many of the illicit growers are addicted to the cash, and that’s something that’s hard to give up,” JD said. And then there are growers who find themselves on the black market simply because of geography. Despite being legal at the state level, local control provisions allow cities and counties to ban cannabis cultivation, so anyone growing in those areas is operating illicitly. Just five months into California’s legal pot journey, it’s probably too soon to say for sure just how many of the state’s cannabis farmers are going to survive. The coming months should be telling. In the meantime, growers face a lot of uncertainty, both on the legal market, and the illicit one. If you have a tip for the Investigative Unit email theunit@nbcbayarea.com. Follow Liz on Facebook and Twitter.